With shrimp in the fridge and snow peas in the garden, I knew I wanted to make a stir fry. Utilizing snow peas in stir-fries is classic, and probably my favorite way to cook them. As I was perusing the latest issue of Cook’s Illustrated, I conveniently came across a recipe for “stir-fried shrimp with snow peas and red bell pepper in hot and sour sauce”. I immediately knew that that would be my dinner the following night. I love cooking magazines, and along with Vegetarian Times, Cook’s Illustrated ranks among my top two favorites. I even wrote a whole paper about the magazine for one of my college courses last year, which is when I found out that Cook’s Illustrated tests their recipes as many as 70 times in order to find just the right combination of ingredients before printing! No wonder their recipes pretty much always turn out amazing, and this one was no different. The key to shrimp is keeping it tender, something that’s certainly not always easy to do. Cook’s recipe calls for a 30-minute marinade that employs the key ingredient of salt to help the robust flavors of garlic and ginger seep into the shrimp as well as to help the shrimp retain their juices while cooking in order to avoid making the them tough. The result: super tender shrimp and a dish that was far superior to those served in most restaurants. 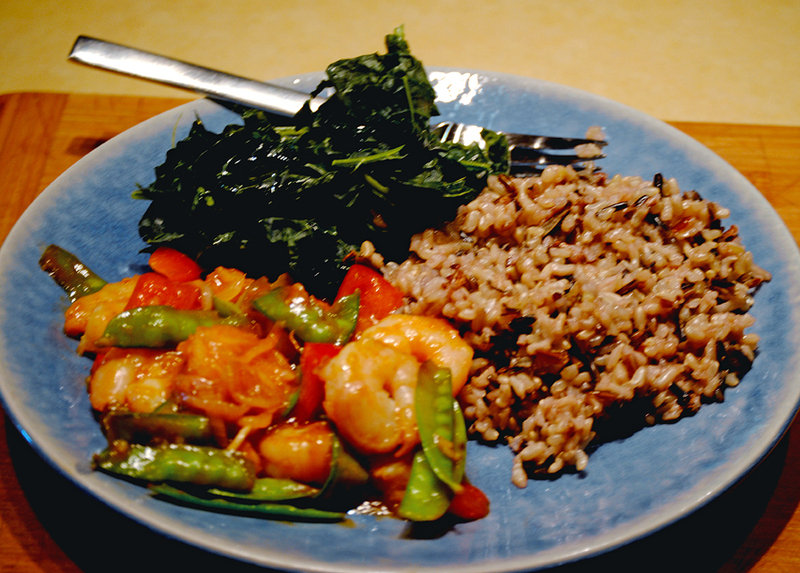 With that I’ll leave you the slightly modified version of Cook Illustrated’s shrimp stir fry. 1. Combine minced garlic, ginger, 1 Tbsp. oil, and salt in a medium bowl. Add shrimp, and let marinate at room temperature for 30 minutes. 2. Meanwhile, whisk soy sauce, sugar, vinegar, Siracha, sherry, sesame oil, ketchup, and corn starch in a small bowl. Combine sliced garlic with shallot in a second small bowl. 3. Heat 1 Tbsp. oil in 12-inch nonstick skillet over high heat until just smoking. Add snow peas and bell pepper, and cook 4-5 minutes until vegetables begin to brown, stirring frequently. Transfer veggies to a medium bowl. 4. Add remaining Tbsp. oil in the now-empty skillet. Add garlic-shallot mixture and cook, stirring frequently, until just beginning to brown, about 30 seconds. Add shrimp, reduce heat to medium-low, and cook, stirring frequnetly, until shrimp are light pink on both sides (about 1 to 1-1/2 minutes). Add soy sauce mixture to skillet; return to high heat and cook, stirring constantly until sauce is thickened and shrimp are cooked through, 1 to 2 minutes. Return veggies to skillet, and toss to combine. Serve alongside rice. Green Bean and Snow Pea Salad + Giveaway! yum, all my favorite ingredients mixed together – perfect! I have a cooking question for you. Wouldn’t salt take liquid OUT of the shrimp? I always thought adding salt to marinades made the meat or protein more touch and dry. How is it that salt makes the shrimp less tough? The recipe DOES look amazing!! In reference to your question, I always thought the same thing about salt. I don’t add it to certain foods like salmon prior to cooking because it draws the salt out. However, Cooks Illustrated said for the shrimp that the salt “enters the flesh of the shrimp, helping them to retain valuable juiced during cooking”. The shrimp turned out surprisingly tender. Honestly, they were some of the most tender shrimp I’ve probably ever had cooked in a dish! THANKS for your answer!! That’s interesting, I never knew that!